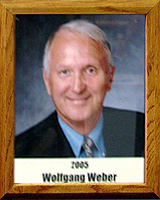 Born in Germany, Wolfgang played soccer as a youth for Victoria Alsdorf from 1955-1965. He went on to play for amateur clubs in Switzerland and Germany from 1969-1972. He immigrated to the United States in 1973 and arrived in Tucson in the late 1970s and has had an impact on the local soccer scene ever since. Initially he coached and played on weekends for teams in the Tucson Metro Soccer League. In 1977 he was co-founder and head coach of the Tucson United Soccer Club and Tucson Soccer Academy, a position he still holds today. His teams have made it to eight state finals and won three state championships (1983, 1999, 2003). From 1981 to 1992, he was Director of Coaching and State Coach for the Arizona State Soccer Association. In 1982 he became the head soccer coach for Salpointe Catholic High School and as of 12/15/04 his record is 387 wins, 46 losses and 8 ties. He has won 21 regional championships; been at 10 Final Fours; 8 state finals and won three state championships.